As could be expected, the retrospective of Marcel Broodthaers (1924-1976) at MoMA was a beautiful show. It opened, and ended, with L’Entrée de l’Exposition (The Entry to the Exhibition, 1974): the staging of potted palm trees at the entrance to the exhibition. Recently this has become the obligatory first move in the game of curating Broodthaers’s posthumous exhibitions. In some occasions, like the exhibition at the Monnaie de Paris, this starting point was grand, while in other occasions, like the retrospective at Fridericianum in Kassel – problematic. 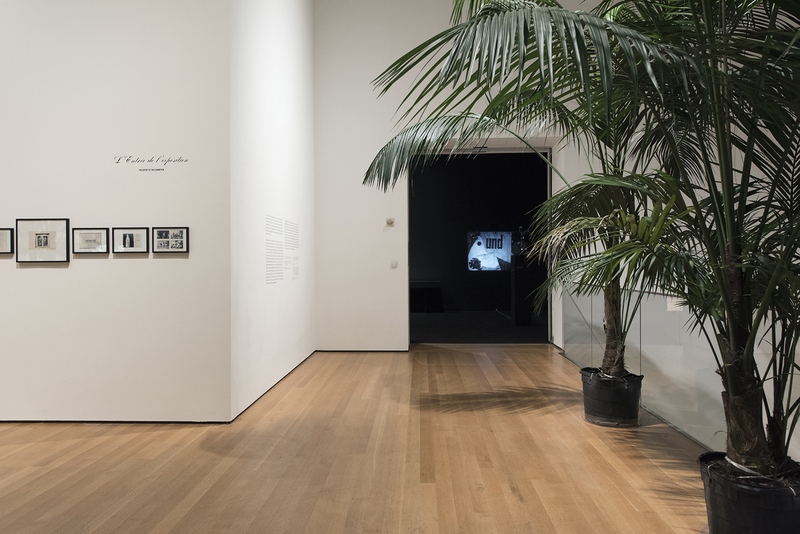 On MoMA’s sixth floor, the work was installed with magnificent palm trees that had traveled all the way from sunny Florida on special delivery; their tops could be detected when one looked up from the museum’s ground floor. The splendid plants occupied the space, while an assembly of editions, photographs, and a panel with the letter “a” hung on the walls, together composing this “Entry”. The presentation of older works within the settings of a tropical winter garden well manifested Broodthaers’s idea of a retrospective: it offered an occasion to transform the museum’s environment into that of a cocktail party. And indeed, the opening reception graced the works with irony, as visitors in fancy dresses, high heels, and elegant suites strolled among movie theater props of 19th century furniture and cannon adorning, as extras, a big snake and crabs playing cards in Décor: A Conquest by Marcel Broodthaers (1975). Regrettably, this event was an exception proving the rule, that all in all, at MoMA, irony, being confused with poetics, falls short. Marcel Broodthaers. Pense-Bête (Memory aid). 1964. Books, paper, plaster, and plastic balls on wood base, without base: 11 13/16 × 33 1/4 × 16 15/16 in. (30 × 84.5 × 43 cm). 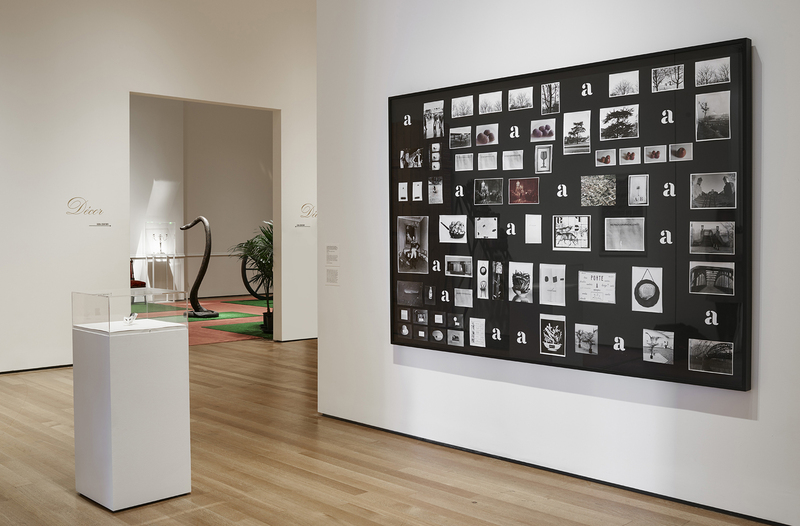 Following the festive entry, the exhibition continued with a thoughtful presentation of Broodthaers’s pre-artistic career - his works as a poet, his early publications: poetry books, photographs, and a screening of La Clef de l’Horloge, Poème cinématographique en l’honneur de Kurt Schwitters (The Key to the Clock, Cinematic Poem in Honor of Kurt Schwitters, 1957). This is a poetic inspection in film of the Dadaist’s assemblages, which Christophe Cherix and Manuel Borja-Villel, the exhibition’s curators, cleverly juxtaposed with some early objects: accumulations of bicycle pumps and eggshells, to which we shall soon return. 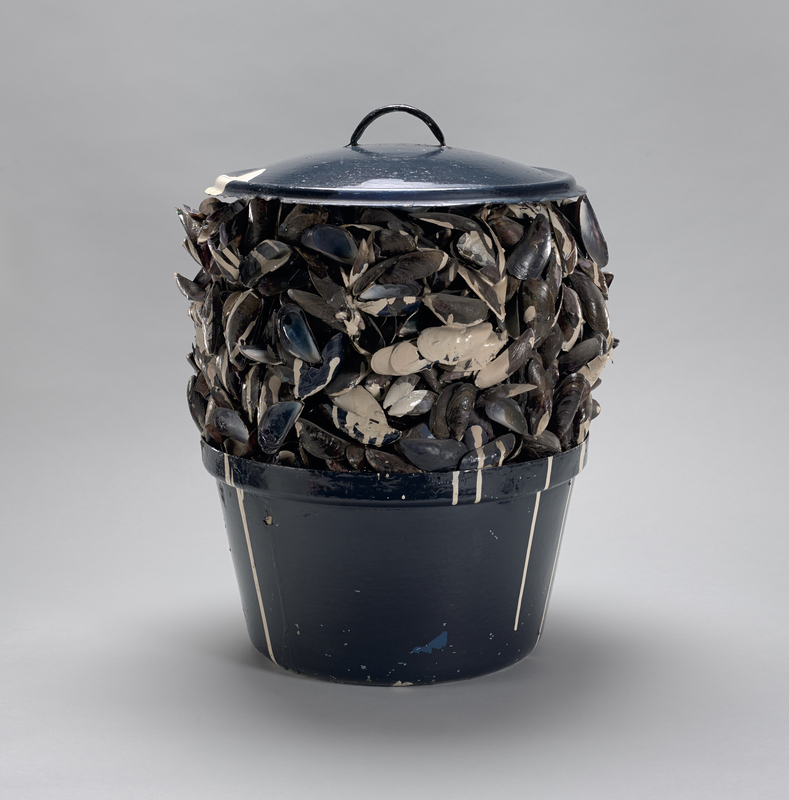 Unfortunately, when all this early production was put into one pot – as mussels in a casserole – Broodthaers’s artistic breakout, due to the financial frustrations of an unsuccessful poet, as he confessed in the invitation to his first art exhibition in 1964, which was also on display here – was somewhat flattened. Marcel Broodthaers. Moules sauce blanche (Mussels with white sauce). 1967. Painted pot, mussel shells, paint, and tinted resin, 14 3/4 in. (37.5 cm) diam. ; 19 1/8 in. (48.5 cm) high. 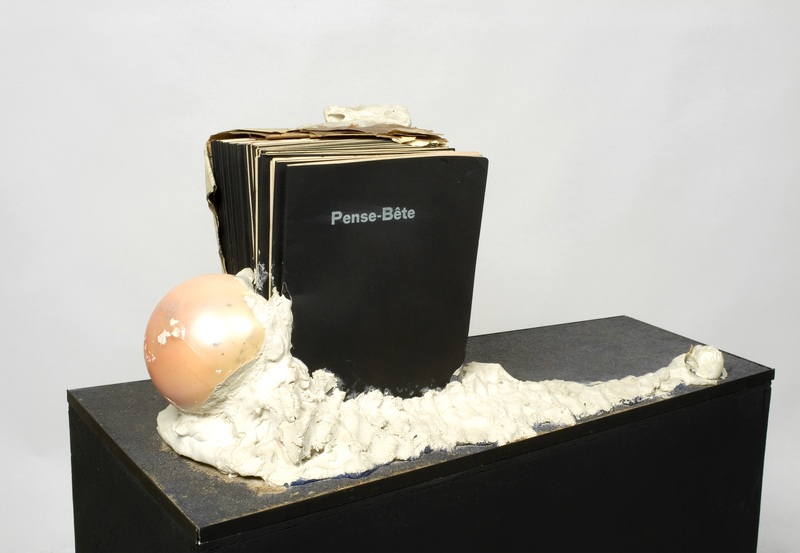 The brutal gesture of embedding unsold poetry volumes in plaster, in the sculpture made of books and titled Pense-Bête (1964), was similarly un-radicalized, by the display of spared copies alongside an interactive virtual copy that included English translations of the poems. 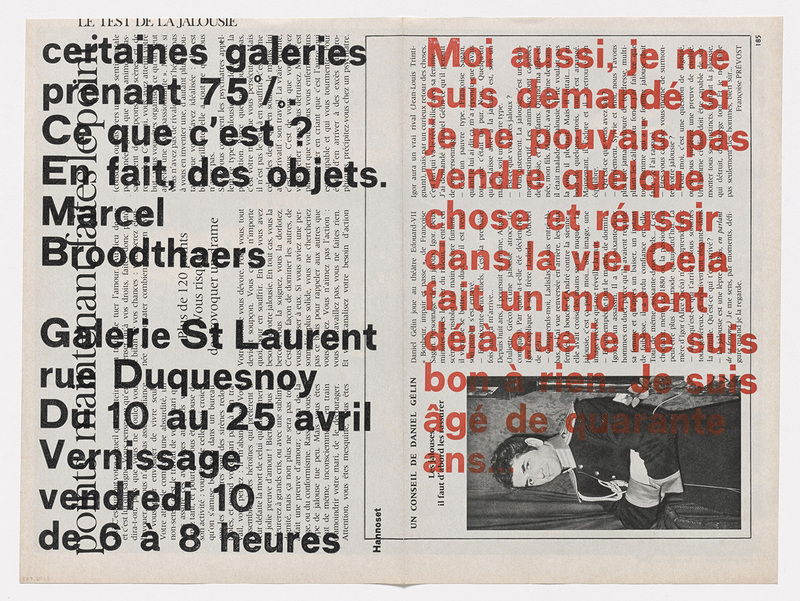 In retrospect, Broodthaers’s provocation proved fortunate – burying the text in sculpture led to its resurrection. The poems, which he had written when he was “good for nothing,” as he put it in that celebrated invitation from 1964 – are finally being read. And so are the objects! Instead of confronting the whimsical and the ridiculous, the viewer ponders over the poetics of the mussel, of the egg. And of the palm tree too? Perhaps the biggest problem is that MoMA has created works of art out of Broodthaers’s radical gestures. Especially tricky was the challenge of presenting the complex Musée d’Art Moderne, Département des Aigles (Museum of Modern Art, Department of Eagles, 1968-1972), the fictive museum Broodthaers had opened in his home and developed as its director, section by section, moving from one place to the next for four years. But here, the Musée d’Art Moderne, Département des Aigles, Section XIXe siècle (Museum of Modern Art, Department of Eagles, 19th Century Section, 1968), has become a slide projection of 19th century masterpieces on an art transport crate, in a museum. Broodthaers’s home, declared a museum, had operated the other way around. It was under the authority of the “Department of Eagles” that Broodthaers presented postcards from the other, real museum, and projected their images on empty art transport crates, which he had rented, calling this a “Museum”. In that context, the domestic became an institution through the fictive direction of the artist. 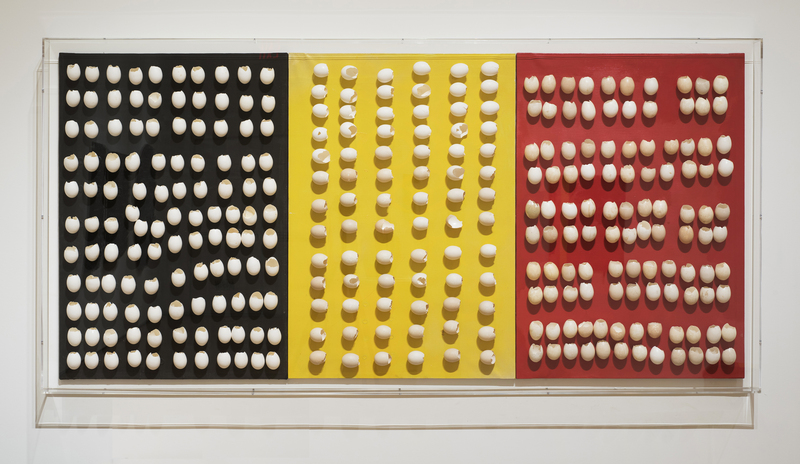 It is rather disappointing that in the framework of a truly rich exhibition, which introduced Broodthaers to the American public, a Museum of Modern Art with no Department or Eagles has domesticated art instead. This article is published as part of a cooperation between Tohu and Basis Magazines.